We had a crazy seven minute storm this evening. Torrential downpour, hail, thunder and lightning--the works. It was over as quickly as it started. I took this photo on my cell phone. 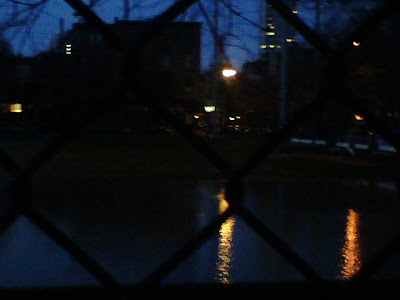 Looks like a moonlit river, but it's actually a baseball field drenched by the storm. I thought the city lights looked pretty reflecting off the water. I went out walking after the storm and headed to my favorite coffeehouse to read. I've randomly picked up a copy of The Great Gatsby again, and I'm so glad I did. I read the book so many years ago and although I remember loving it, I'm not sure I fully appreciated how incredibly well-crafted and insightful Fitzgerald's sentences really were. Isn't it nice to revisit a beloved book at different points in your life and to see how your perceptions change? "He smiled understandingly--much more than understandingly. It was one of those rare smiles with a quality of eternal reassurance in it, that you may come across four or five times in your life. It faced--or seemed to face--the whole external world for an instant, and then concentrated on you with an irresistible prejudice in your favor. It understood you just as far as you wanted to be understood, believed in you as you would like to believe in yourself, and assured you that it had precisely the impression of you that, at your best, you hoped to convey."